Mike Grace has been a professional musician most all of his life. From playing ranch parties and road houses in Texas to touring the world with his trio or quartet Mike has made performing classical and jazz music his passion. Along the way Mike found an excitement in teaching and when asked by former university colleagues to join the local faculties he readily began a career in teaching with the same passion he had for performance. Combining university and public school teaching allowed Mike 35 years in music education, all the while continuing a vigorous performance schedule covering many parts of the world. His college and university students as well as his high school graduates became many of the worldʼs finest performers and teachers. It is difficult to separate Mikeʼs teaching and performing accomplishments as they are so melded together. Among Mikeʼs most treasured moments in education is being named a Disney- McDonaldʼs Performing Arts Teacher in 1996. And, being named University of Michigan Musical Societyʼs Educator Of The Year, the year after retiring from the Ann Arbor, Michigan, Public Schools make these two honors highlights of his professional life. But, the Community High School Jazz Program will alway remain his favorite educational accomplishment, a program of many combos which rose to a level of over 300 performances annually, winning almost every award at jazz festivals world-wide. Among the many performers Mike has had the great fortune to perform with are Dave Brubeck, Dizzy Gillespie, Mel Tormeʼ, Rob McConnell, Roger Williams, Urbie Green, Billy Taylor, Clark Terry, Dee Dee Bridgewater, Henry Mancini, Jimmy Forrest, Peter Appleyard, Randy Brecker, Rosemary Clooney, Sonny Stitt. John has performed with a number of Canadian jazz notables including Duncan Hopkins, Peter Appleyard, Phil Nimmons and Alex Dean as well as vocalists Jackie Richardson, Trish Coulter, Heather Bambrick, and Carole Wellsman. He has performed at international blues/jazz festivals in New Zealand ( Queenstown ) and Romania ( Focsani ) and is composer/pianist/co-founder with The Phoenix Jazz Group whose original music can be heard on jazz radio stations including Jazz FM 91.1 in Toronto. Wayne began playing cornet at an early age and joined the Port Elgin Town Band under the direction of Ed Smith. Wally Scott, was his first trumpet teacher. In the mid-sixties, Wayne joined the “Comets” and played at the Casino each summer for four years and also played along with his dad in the Doug Matheson Band. Meeting master teacher Don Johnson was the deciding factor in attending the University of Western Ontario studying music. A successful music teaching career in Port Elgin at both elementary and secondary levels resulted in his induction into the Saugeen Shores Hall of Fame in 2008. Wayne has performed in numerous musical groups including 25 years with the Stardust Big Band. He has played with Razz-ma-tazz, the Symphony, the Noodle Factory and is the founding member of the Men In Black horn line which has joined Lulus rock band on many gigs. Wayne has been a long time member of the Southampton Summer Music staff. He has been writing and arranging more and more which includes the horn parts for the Jailhouse Rock Band, Noodle Factory, Port Elgin Community Band, Summer Music and the Southampton Community Band. After many years teaching music at Chesley District Community School, Brian has moved to Owen Sound District Secondary School. Brian is a long-time trumpet instructor at ﻿Southampton Summer Music﻿. Brian, a founding member of Noodle Factory, is a university-trained vocalist and he lights up the stage with his energetic performances. Al is a trumpet player, music educator and conductor who for over 25 years taught instrumental music for the Avon Maitland District School Board. While an undergraduate he obtained a degree in piano performance, studying with John Paul Bracey at Western University. Trumpet studies have been with James Ford (Western University), Rbt. Oades (Univ. d’Ottawa), Don Johnson (Humber College), and jazz with Mike Malone (Mohawk College). Post-graduate conducting courses have been with Simon Streatfield (Vancouver Symphony, et al). In the 1990s Al worked in the Grey/Bruce/Huron area as director of the Lighthouse Swing Band. In 1998 he started a new career as a ship musician travelling the world, playing in show bands, dance bands and jazz with the major cruise ship companies: Cunard, Princess, Norwegian, Celebrity, Holland America, etc. After 16 years he has settled down in Goderich, again directing the Lighthouse Swing Band, playing cornet in “The Howlin’ Dog Vintage Jazz Band” and the Kincardine Brass Band which just leaves time for French horn in the Goderich Laketown Band, trumpet in The Suncoast Brass Quartet, solo performances and lately, The Noodle Factory. Tim Eaton is a third generation trumpet player who has performed in South America and the Caribbean. As well he has performed the fanfares at the Stratford Festival His musical experiences include performing with bands of the Royal Canadian Regiment and the Royal Regiment of Toronto,He has also taught music and drama in Northern Ontario and Owen Sound. Locally he played with the Stardust Big Band and he has been playing with the Georgian Bay Symphony since 1991. Tim just retired from a career of teaching music and drama. ​​Peter is a very active musician in the Owen Sound area. He has performed in and led many successful groups. He has been involved with the Roxy theatre and Owen Sound Little Theatre for many years and can often be found playing in the pit there. An alumnus of the Stardust Big Band, Peter is also a founding member of Noodle Factory. Pete has been playing music for the past 50 years; from navy cadets to 9Lives Rock and Soul in Ulverstone Tasmania .. trad jazz , tribute bands , small ensembles . Pete fronts several bands and is available for bookings . ​Kerrie Lynn Boys hails from Southampton Ontario. Former member of the Stardust Big Band, this trombone player has a soft spot for all things "Miller" as in Glenn Miller. She also enjoys the melodious tunes of The Rat Pack--especially Dean Martin. Kerrie Lynn has been teaching with the Bluewater District School Board for over 20 years and currently teaches music at Saugeen District Secondary School in Port Elgin. ​Hugh McGregor, originally from Windsor, was an instrumental secondary school music teacher in Huron County. He has been the music director of the Goderich Laketown Band since 2007, and currently enjoys playing trombone in a number of area bands including Kincardine Brass Band, Lighthouse Swing Band and his own quartet, Suncoast Brass. He lives in Goderich. Over the past thirty plus years, Ron has performed with many local groups including Stardust Big Band, Jailhouse Rock Band, and served as guest conductor/clinician with many high school groups and music camps. Ron also co-conducts the Port Elgin Community Band with his good friends and musician colleagues, Cam Porter and Ian Burbidge. Ron continues to have a keen interest in music education and loves the opportunity to perform with such a talented group of musicians and friends in Noodle Factory Jazz Project. ​Ian has long been an active part of the musical scene in Port Elgin and Kincardine. He taught high school in both towns and has been a member of several performing groups from folk to rock to jazz. He has been writing music for over 40 years and helped to form Noodle Factory partly as an outlet for his arranging and composition. ​Jason studied music at McGill and The New England Conservatory. He is an outstanding jazz soloist and has performed with many of today’s great jazz musicians. Jason has toured with Michael Bublé among others. A regular performer at Tramonto in Kincardine, Jason plays saxophone whenever he gets a chance. Cam recently retired from teaching music at Port Elgin Saugeen Central School. His school bands as well as the ﻿﻿Port Elgin Community Band﻿﻿, which he founded, consistently take gold at music festivals. Cam was a long-time member of the Stardust Big Band before helping to form Noodle Factory. Cam has written a number of compositions for the band. Cam also plays with other groups in the area and is the leader of a Beatles tribute band – “Get Back”. ​Brian was raised just down the road in Kincardine. He moved to London almost 20 years ago where he now teaches and makes music with the Prime Time Big Band, the Moonliters, and the John Griffiths Quartet. ​Nicole 's wonderfully clear vocal performances can be heard regularly with the Lighthouse Swing Band. We are delighted to feature Nicole in our 10th anniversary concert. Nicole and Brian W. will recreate "City of Stars" from "La La Land". Nicole will also be featured on "Orange Coloured Sky" in an arrangement by Don Buchanan. All three of our vocalists will team up for another number from "La La Land" - "Another Day of Sun"
​ Brian is a versatile performer and will be featured on several numbers in our 10th anniversary concert. From Gershwin's "Summertime" to Blood Sweat & Tears' "Hi De H"o and Michael Jackson's "Thriller", when Brian is singing there is sure to be excitement. Brian will also join Nicole on two numbers from "La La Land". Brian was recently nominated for best jazz vocalist in the London area. In high school at Kincardine District Secondary School, Brian started an a cappella group based on The Nylons and he has been singing ever since. We are delighted to feature Brian on two numbers in our concert. 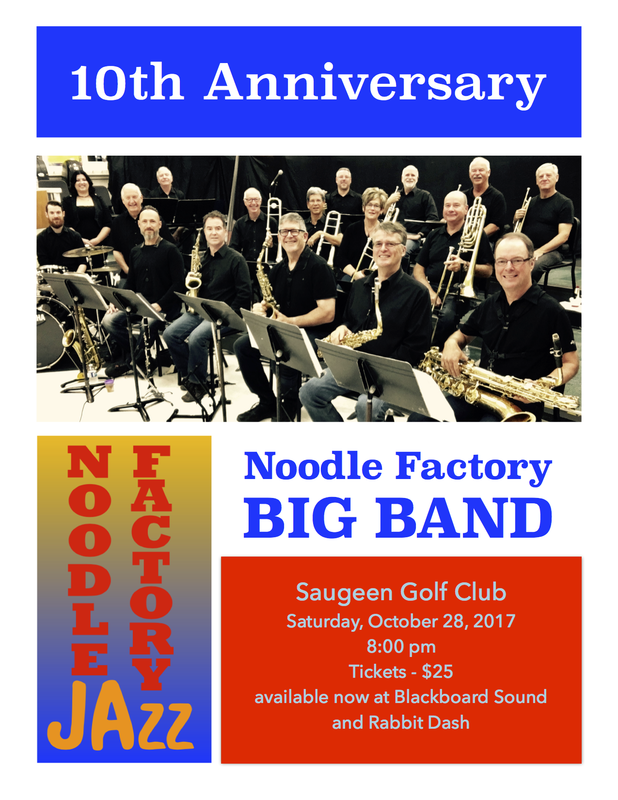 All of the arrangements for Noodle Factory Big Band are written by Ian Burbidge except "Orange Coloured Sky" which was arranged by Don Buchanan.